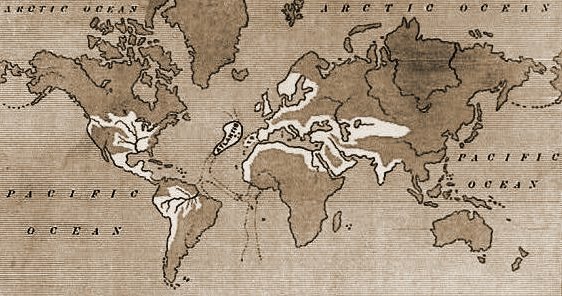 Thousands of books and theories have been written about the lost continent of Atlantis, but what do we really know for sure? Well, nothing. The story of Atlantis was initially generated by Plato but, even this, is only a version of what had been heard second or third hand. If we think about it, there is no reason why a continent or country shouldn't have sunk beneath the oceans. Maybe that's what Noah in the Bible is all about. But let's look at Plato's original story. The Atlantis story comes from two dialogues recorded by Plato: Timaeus and Critias. Critias was actually Plato's great-grandfather. In Timaeus the discussion is about versions of the ideal state or country - Utopia if you like. Critias then gives his version of Atlantis - which he heard from his grandfather, who heard it from a friend of his fathers. So it is something that may well have been handed down over generations. The problem of this is, as with Chinese Whispers, the original version can become distorted over time. "Our records tell how your city checked a great power which arrogantly advanced from its base in the Atlantic ocean to attack the cities of Europe and Asia, For in those days ... there was an island opposite the strait which you call the Pillars of Heracles (Straits of Gibraltar), an island larger than Libya and Asia combined. On this island of Atlantis had arisen a powerful dynasty of kings, who ruled the whole island ... in addition they controlled Libya up to the borders of Egypt and Europe as far as Tyrrhenia. This dynasty, gathering its whole power together, attempted to enslave your country and ours and all the territory within the strait. It was Solon who led an alliance of Greeks ... who was forced to overcome the invaders and finally celebrated victory. At a later time there were earthquakes and floods of extraordinary violence, and in a single dreadful day and night ... the island of Atlantis was swallowed up by the sea and vanished; that is why the sea in that area is impassable to navigation, which is hindered by mud ... the remains of the sunken island. With Critias the story goes back to gods and the likes. It tells of how the gods divided up the Earth. Athene was given Greece and founded the Athenian state and Poseidon received Atlantis. Poseiden made love to one of the island's girls - Cleito - and had ten sons by her. Each of these sons became ruler of part of Atlantis, with the overall king being Atlas (thus the name Atlantis and Atlantic). The ten sons, as Atlantean kings, met up every sixth year to discuss laws and to pass judgement on wrongdoers. All went well for a long time and high moral standards were kept. But then the residents and kings became ambitious and greedy and Zeus decided to punish them. ... and that's all we really know from the original Plato writings. 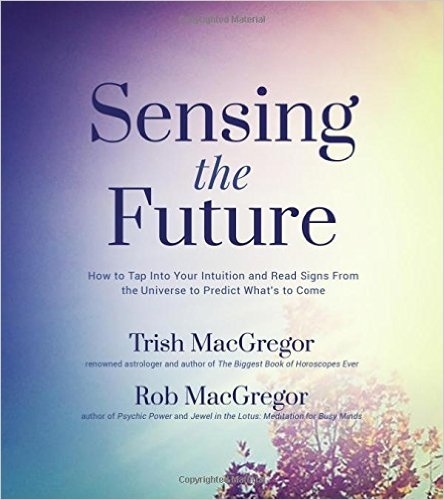 From there on books and writings have developed and theories developed. 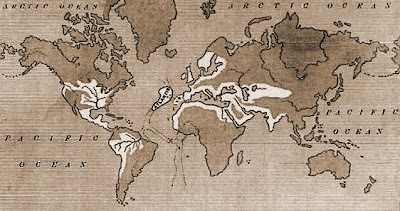 In the The History and Power of Mind , for example, Richard Ingalese writes that Atlantis stretched from Northern Africa to the West Indies and the people who incarnated as Atlanteans were those who had been on Lemuria - another sunken continent. According to Ingalese Atlantis reached the highest point of development, but materialism swept over the continent (sounds familiar!) and people turned to sensual abandonment. "Atlantis became a continent where a few immensely wealthy, powerful and strong egos rules the majority of the people, and made them their slaves." All of this brought a reaction - karma - and Atlantis suddenly became submerged. Before the continent sunk beyond trace the upright inhabitants were taken to other countries by the Adepts and other civilisations were originated. The most advanced people moved to North Africa and laid the foundations of the Egyptian Empire. Though, at the present time, we cannot establish the first hand truth about Atlantis there may well still be lessons we can learn from the stories themselves - there is a certain familiarity. Top: Atlantis by Patroclus Kampanakis. 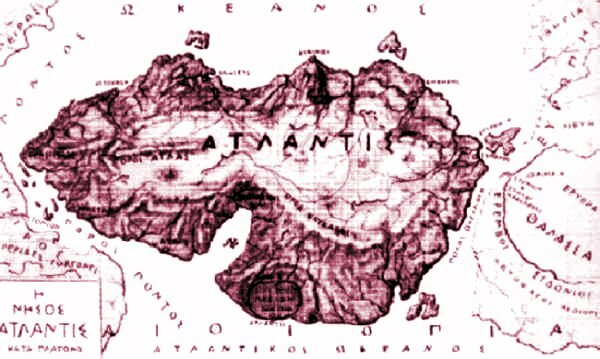 Originally drawn in 1891, first published in his book "The procataclysm Communication of the Two Worlds via Atlantis"
Middle: 1882 Map of the Atlantean Empire, from Ignatius Donelly's "Atlantis: the Antediluvian World" 1882.